Heritage Grand at Cinco Ranch offers modern amenities and homes for sale for around $250,000. Living in Houston, the country’s fourth largest city and the biggest city in Texas, opens the door to a diverse and enriching way of life for active adults. Houston is home to an exciting sports scene and offers a never-ending array of activities and events, from touring museums and dining at world-class restaurants to experiencing the one-and-only Houston Livestock Show and Rodeo, the world’s largest livestock show. While Space City offers a rich culture, active adults don’t need a rich budget to reside here. Houston contains more than a dozen active adult communities with reasonably priced Texas homes for sale. Here’s a closer look at a few 55+ communities that contain homes for around $250,000 in Houston. Situated along sparkling Lake Conroe, Villas at White Oak Ranch is a brand-new 55+ community that will contain just 91 single-family homes upon completion. For active adults who desire a close-knit community and stunning homes available for around $250,000, Villas at White Oak Ranch is a great fit. Active adult homebuyers can explore six distinct floor plans that range in size from 1,654 to more than 2,500 square feet. These low-maintenance homes are designed with active adults in mind, featuring sprawling first-floor master suites, majestic nine-foot ceilings, and luxurious outdoor spaces. Whether active adults prefer an all-masonry exterior if they like the look of stucco, they have their pick in this upscale community with a variety of Texas homes for sale. It's easy to get to know your neighbors in this vibrant community, which hosts a variety of planned classes and social clubs. Residents can join a running or walking club or make new friends at outdoor movie nights and wine-tasting events. A community clubhouse includes an exercise room, aerobics studio, and arts and crafts studio. Outdoors, homeowners can relax at the luxurious pool, take their furry family members to the dog park, or pause and soak in the area’s natural beauty from the picturesque gazebo. Active adults can enjoy first-class amenities and activities at Windsor Lakes, just 40 miles north of Houston in The Woodlands. However, they don’t have to pay first-rate prices to own a home in this serene community. Texas homes for sale in Windsor Lakes start in the high $100s, putting this neighborhood within reach for many active adult homebuyers. Energy-efficient, single-family homes range from 1,739 to 2,366 square feet. Active adults who don’t need as much space but don’t want to sacrifice comfort will find the community’s patio homes appealing. These homes range from 1,491 to 2,210 square feet. Living in Windsor Lakes means active adults can pursue all their favorite hobbies and stay as socially engaged as they’d like. A full-time activity director plans a variety of fun events, or residents can join clubs for different interests such as readers theatre, dinner, exercise, and dance. A 20,000-square-foot clubhouse serves as the neighborhood hub, featuring a fully equipped exercise room, billiards room, arts and crafts room, and library with computers. Luxury living doesn’t always come with a luxury price tag, and Bellavita at Green Tee serves as proof. 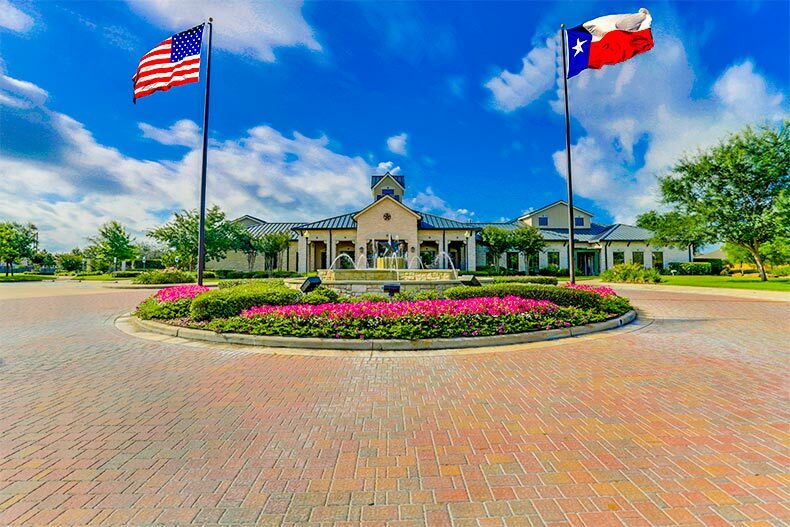 This upscale 55+ community in Pearland, just 30 minutes south of Houston, offers active adults an appealing blend of lifestyle, culture, and recreation. Active adults can discover homes on a resale basis that range in size from 1,500 to more than 2,400 square feet. A homeowners’ association fee covers alarm system monitoring, lawn service, cable, and access to all of the neighborhood’s amenities. A 14,000-square-foot, Mediterranean-style clubhouse stands at the heart of Bellavita at Green Tee, giving residents access to a fitness center, computer room, and ballroom. On a beautiful day, homeowners can head to the pristine outdoor pool and spa or enjoy the nine-hole putting green with friends. Golf enthusiasts can join the Green Tee Country Club for an additional fee. With an enriching array of activities such as Bible study, line dancing, yoga, and canasta, it’s easy for active adults to pursue all the things that make them happy. Active adults who want to live in a master-planned community but worry about the price tag should explore Heritage Grand at Cinco Ranch. Part of Katy’s master-planned Cinco Ranch community, this 55+ enclave includes homes that start in the low $200s. Here, active adults can discover boundless indoor and outdoor amenities in addition to an array of spectacular single-family and duplex homes. Single-family homes range in size from 1,561 to nearly 3,000 square feet while duplex homes offer either 1,611 or 1,896 square feet. No matter the size or style, all homes include first-floor master suites, sprinklers, and monitored alarm systems. The Heritage Grand clubhouse serves as the community’s destination for fun and socialization. Residents can stay physically fit at the well-equipped fitness center, mingle with friends at special events in the ballroom, or meet up with others at weekly coffee socials and potlucks. The good times continue outdoors, where residents can play basketball, shuffleboard, horseshoe, and bocce ball or swim laps in the pool, which includes lap lanes and a counter-flow exercise circle.